A potent review of the duo tape I did with Rogier Smal earlier in the year from Mr Joe Murray. Still some copies of this one available. 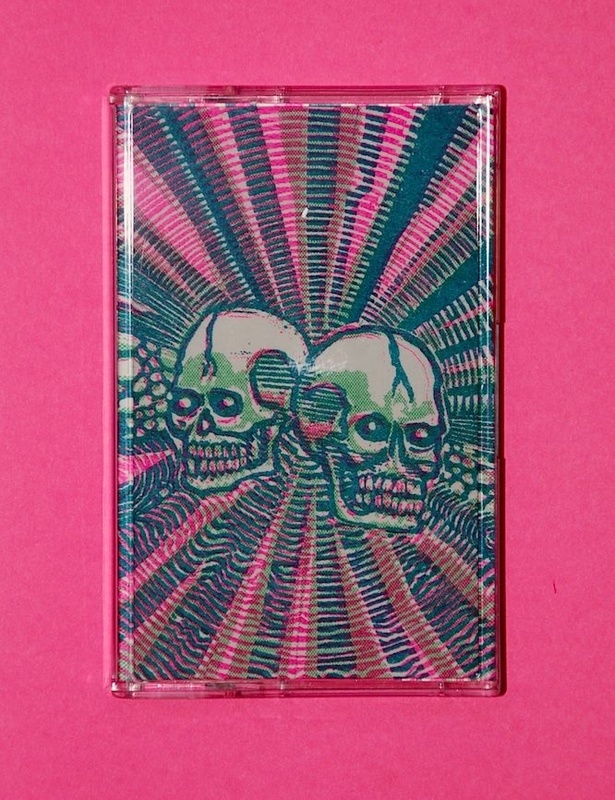 “An eye-watering tape cover, all pink vibrations and Mexican skulls houses this crispy duck. Warble-guitar rubberises snazzy drums all over side one with the clitter-clatter meshing like oilbeads. Dave’s dextrous volume pedal work gives the six string a human voice…an open-mouthed gasp that speaks in a dialect from the lost land of Atlantis. When the silvery bubbles of air float up they get well and truly popped by Rogier’s mini-trident as floppy skins (drum kit) pound like a war cry. Up Helly-Ah! Texture is explored for sure but it’s got a furry quality, like mould-ridden cheese, that makes me salivate grey goo down my shirt front. I saw these two live recently and was blown away by their Crimsons. Diggerty velocity and ultra-hard riffin’ that stopped on a dime leading to Pinteresque silence and uncomfortable stares. And it’s good to hear those dip-outs, troughs and fallows on this pinky tape. Too many beards just jam it without no contrasts…saps. The chaps got chops! Side two starts off all mellow and that with a ribbed ripple, a cluster of notes that dart and dive around Smal’s dropped grenades. But these explosions become milestones, stately markers on a voyage over rough terrain before they gradually morph into the start of the Pink Panther show (circa 1979).